Meet and assist upon your arrival at Abu Simbel airport by our REP and transfer to board MS Eugenie Lake Nasser Cruise Boat. Lunch served aboard before your visit to the Temples of Abu Simbel. Back to the ship for dinner and overnight aboard. Breakfast aboard the ship with free time at leisure. Lunch will be served while sailing to Kasr Ibrim. Upon arrival, a tour of the Citadel of Kasr Ibrim will be conducted from the ship’s sundeck, “entrance to is not permitted” . Dinner aboard the cruise and overnight stay. Sail to Amada. A.M. visit the Temples of Amada, Derr and the Tomb of Penout. Return to the ship for lunch while sailing to Wadi El Seboua. Upon arrival, discover the Temple of Dakka and the Temple of Meharakka. Dinner served aboard the cruise and overnight stay. 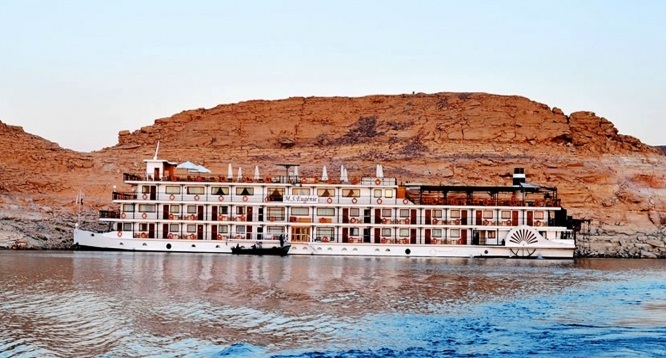 Sail to Aswan and cocktail while crossing of the Tropic of Cancer. Lunch aboard. As soon as your arrival in Aswan, visit the Kalabsha Temple, Beit El Wali, and the Kiosk of Kertassi. back to the ship for dinner. Overnight stay.